1.0 – Breaking Down Gaits – It’s All In The Spine! 1.1 – Why Focus on the Spine? In this page I want to demonstrate how to effectively apply complex quad mechanics to your animation without getting bogged down placing and adjusting footfalls over and over. I call it ‘Spine Gaits’… and yup it’s all about timing patterns of the chest and hips during particular gaits such as the gallop, trot, walk etc. This is a general tool to be used as a guide for recreating gait cycles in your animation. Spine Gait Definition: The timing offset ratio of the chest and hips in different gaits derived from tracked reference. Using Spine Gaits: Use these values to work out the general timing offset of the Chest and Hips in a particular cycle of any length. Understanding Spine Gaits: Dissect all kinds of reference (not just gaits) and apply the rules/observations you find. I was reproducing the same animation curves over and over. If I didn’t get the spine right, the footfalls wouldn’t work. Identifying curve patterns in the major gaits lets you work out general rules. Spine Gaits are simple compared to complex footfall patterns and if you animate them first you can use them to map or guide your footfalls later. Footfalls are only there to catch the weight of the spine, they are servants to it. This idea is also discussed in Hide the Legs!? and the application is shown in the Five Step Quadruped Method. You can apply spine gaits and what you observe in reference far more easily to IK spine rigs than to FK, so avoid FK if you can! The Transverse Gallop is one of the most common gallops in quadrupeds and there is an obvious offset in the rise and fall of the chest and hips. They are not in sync. This offset timing of the chest and hips is the heart of the gallop cycle and all other gaits. If you get this wrong your footfalls won’t work and your cycle/animation will feel broken. The curves are similar in shape but their lowest point is offset by 3 frames. This value is important and is the key to finding out the spine gait of a gallop. The first contact of the foot fall happens before the y curve starts to decelerate. Not at the bottom of the curve! From this we can tell the front left foot in a gallop takes all of the weight in the chest before the front right foot lands. In this case, the front right leg is used for propulsion. This can vary in gaits depending on which leg is the lead leg. Read more about the lead leg here. The back legs are more in unison and act more like a spring than a limb. So, the fore limb supports and balances. The hind limb pushes. See Pendu-limbs for more about this. 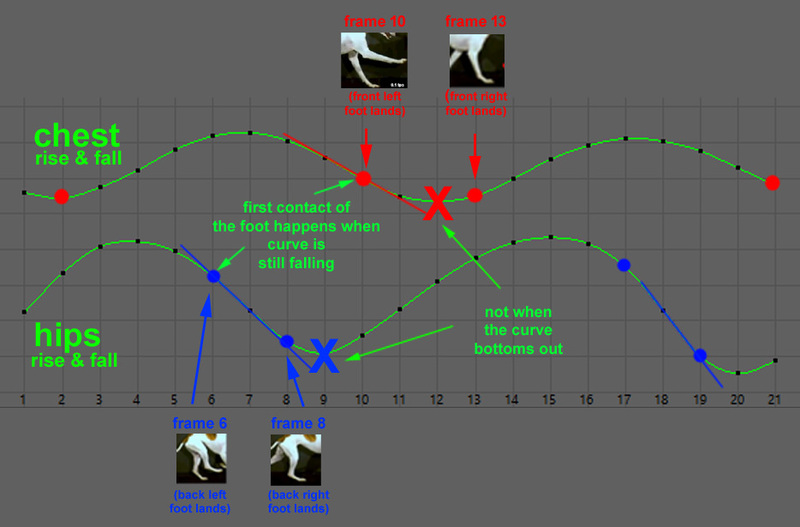 Comparing these examples, the gallop versus the walk has quite a similar offset, 3 frames vs. 3.6 frames. Compared to trot, it is completely different with an offset of only 1 frame. But this is only half the story. To make Spine Gaits useful we have to see it as a ratio that can be used across all quads. For example, a bull’s gallop cycle may be twice the length of a dogs, but the Gallop Spine Gait will be relatively the same. The below gallop spine gait is 27%. Which means, the chest and hips are offset in their rise and fall by 27%. So to use, take the frame length of your chest cycle and calculate 27% of it. This value will be the offset value to apply to the hips. Because spine gaits values tell you the approximate offset value between the chest and hips in major gaits you can make your own curves on the fly. Just use the value for reference. 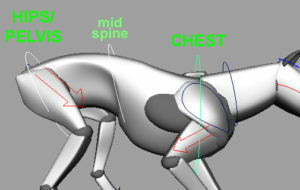 To see the full process using Spine Gaits see the Five Step Quadruped Method. The above animation may not look much, but it has the underlying mechanics of walk into a trot based on reference. This means the when you apply the feet you will be able to use the curves as reference to there timings. Simple! In the following video I take the spine gait track from a walk and apply it to my blocking. This next video shows how to combine two spine gait tracks into your blocking. To see the full process look at the Five Step Quadruped Method. Below are the gait video references I used for this tutorial. Or if you would like to know more about gaits in general, see my Gait Reference page.